the one Minute manager story. The one minute manager is the story of a young man. The young man wanted to become a manager. He begins a search to find a manager that works in both areas: employee interest and organization profit. After taking interview of leaders, managers, directors, entrepreneurs, government administrators, and university presidents. He found, manager applies two methods to lead there organization. Either they are autocratic or democratic managers. An autocratic manager focuses on organization goals and profit but loses employees interest. While democratic manager focuses on employees and loses organization goals and profit. 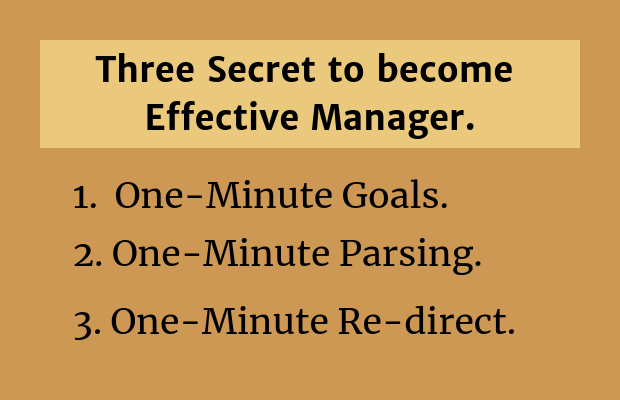 Three secret of one minute manager. At the end, he found the manager that works in both employee interest and organization profit. He takes an appointment to visit him. In the interview, the manager reveals three secrets to lead organization. Take a sheet of paper and write down your goals on a paper. Then, below the goal you have set, give a brief description and a deadline. Once you set a clear goal for the next month or year, review your goals with the manager so that you can match your goal with the organization goals. The issue in most organization, employee do not write goals. If you ask a chap in an organization about his goal and then ask the manager about the goals of an employee. It comes out two different target that causes conflict. Writing each goal on a single page and describe your goal in 200-250 words so it takes less than one minute to read. As it takes less than a minute, you will not procrastinate to check your goal on a daily basis. Once you inure to check goals. You can identify, either you are in alignment with your goal or not; and can make necessary changes to achieve goal faster. 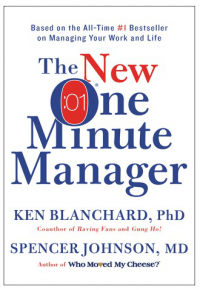 In most organization, manager reviews the performance of an employee and find out what employee is doing wrong, but the one minute manager takes different approach. At the beginning of every project, he looks the working style of an employee and finds out the little things an employee was doing right. The manager thoughts, it is not a good idea to punish an employee when he is working on a new project. He belief punishment did not work for inexperienced folk. It is better to praise an employee for little things and encourage him to do the same things more. An employee got immediate feedback. Now he knows the important tasks to put his energy and can cut the unimportant and he did not have to wait for performance review. Yes. We make mistake. When the manager found an employee doing something wrong, he did not criticize him. First, he confirms facts and then tells him how he feels on his mistake. The manager pause for a moment so that employee can feel too. After that, the manager tells: you are better from your mistake and I trust in you and I expect you will not repeat the same mistake again.